For other uses, see Golden Horseshoe (disambiguation). The Golden Horseshoe is a secondary region of Southern Ontario, Canada which lies at the western end of Lake Ontario, with outer boundaries stretching south to Lake Erie and north to Lake Scugog. The region is the most densely populated and industrialized in Canada. With a population of 7,826,367 people in its core and 9,245,438 in its greater area, the Golden Horseshoe accounts for over 21% of the population of Canada and more than 55% of Ontario's population. It is part of the Quebec City–Windsor Corridor and the Great Lakes Megalopolis. Location of the Golden Horseshoe in Ontario. The core of the Golden Horseshoe starts from Niagara Falls at the eastern end of the Niagara Peninsula and extends west, wrapping around the western end of Lake Ontario at Hamilton and then turning northeast to Toronto (on the northwestern shore of Lake Ontario), before finally terminating at Oshawa. 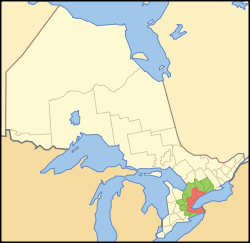 The term "Greater Golden Horseshoe" is also used to describe a broader region that stretches inland from the core to the area of the Trent–Severn Waterway, such as Peterborough in the northeast, to Barrie and Lake Simcoe in the north, and to the Grand River area, including centres such as Brantford, Waterloo Region, and Guelph to the west. The extended region's area covers approximately 33,500 km2 (13,000 sq mi), out of this, 7,300 km2 (2,800 sq mi) or approximately 22% of the area is covered by the environmentally protected Greenbelt. The Greater Golden Horseshoe forms the neck of the Ontario Peninsula. View of the western edge of Lake Ontario (left), with Cootes Paradise to the west (right) in Hamilton. The region derives its name from the horseshoe shape of the western edge of the lake. The "horseshoe" part of the region's name is derived from the characteristic horseshoe shape of the west end of Lake Ontario with Cootes Paradise between Burlington and Hamilton roughly positioned in the centre. The "golden" part is historically attributed to the region's wealth and prosperity, according to the Canadian Oxford Dictionary. Hamilton in 50 years will be the forward cleat in a 'golden horseshoe' of industrial development from Oshawa to the Niagara River ... 150 miles [240 km] long and 50 miles [80 km] wide ... It will run from Niagara Falls on the south to about Oshawa on the north and take in numerous cities and towns already there, including Hamilton and Toronto. The speech writer who actually penned the phrase was Charles Hunter MacBain, executive assistant to five Westinghouse presidents including Rogge. The Golden Horseshoe has been recognised as a geographic region since the 1950s, but it was only on July 13, 2004 that a report from the provincial Ministry of Public Infrastructure Renewal entitled Places to Grow coined the term Greater Golden Horseshoe, extending the boundaries west to Waterloo Region, north to Barrie/Simcoe County, and northeast to the county and city of Peterborough. A subsequent edition released February 16, 2005, broadened the term further, adding Brant, Haldimand and Northumberland Counties to the now quasi-administrative region. The Greater Golden Horseshoe region is officially designated in Ontario Regulation 416/05 under the Places to Grow Act. The designation Greater Golden Horseshoe has legal significance with respect to taxation: In April 2017, the Government of Ontario announced plans to impose a 15 per cent Non-Resident Speculation Tax (NRST) on non-Canadian citizens, non-permanent residents and non-Canadian corporations (with exceptions or rebates for refugees, qualifying students and certain people working in Ontario) buying residential properties containing one to six units in the Greater Golden Horseshoe (GGH). The provincial transit authority Metrolinx makes use of the term Greater Golden Horseshoe. The Metrolinx definition is consistent with the original 2004 Places to Grow definition. However, the city and county of Peterborough is not included. The population of the Golden Horseshoe was 7.82 million residents at the 2016 census. The region is projected to grow to 11.5 million people by 2031. The economy of this region is very diverse. The Toronto Stock Exchange is the third largest in North America by market capitalization (after the New York Stock Exchange and NASDAQ), and seventh largest in the world. A worker installing car batteries at Ford's Oakville Assembly. The automotive industry is a major sector of the Golden Horseshoe's economy. Cities such as Hamilton, Oshawa, Oakville, Whitby and Kitchener all contain major large-scale industrial production facilities, Hamilton being dominated by the steel industry and Oakville and Oshawa primarily in the automotive industry. Other significant automotive-production facilities also exist in Brampton, St. Catharines, Cambridge and Alliston. While manufacturing remains important to the economy of the region, the manufacturing sector has experienced a significant decline since 2000 as a result of unfavourable currency exchange rates, increasing energy costs, and reduced demand from the United States, which is by far the largest market for Ontario's goods. Hamilton and Toronto also have two of the largest seaports in Lake Ontario. The Welland Canal system handles tanker ship and recreational traffic through the Great Lakes. Large rail and truck distribution facilities are located in Toronto, Vaughan and Brampton. Food processing is also a key ingredient in the economy. The Niagara Peninsula is Canada's largest wine growing region and a major producer of Ontario wine. Niagara Falls has one of the world's largest per-capita tourist economies, benefiting from millions of tourists coming to see its majestic waterfalls, shop in its numerous stores, and visit its many attractions. The winemaking and fruit growing industries of the Niagara Peninsula produce award-winning wines, which are beginning to attract attention around the world, in particular the ice wine for which the region is known. However, as of 2014, sectors such as information technology, health care, tourism, research and finance provide the bulk of growth in the Golden Horseshoe. The suburban cities within Greater Toronto such as, Brampton, Markham, and Mississauga, along with the city of Waterloo, are emerging as hubs for technology and innovation. The Golden Horseshoe is home to several universities, including the University of Toronto and McMaster University in Hamilton, which are ranked 1st and 4th in Canada, respectively, by the Academic Ranking of World Universities. Other universities in the region include Brock University in St. Catherines, Trent University, York University, OCAD University, University of Ontario Institute of Technology, University of Waterloo, Wilfrid Laurier University in Waterloo, University of Guelph and Ryerson University. There is also a strong integration between the universities and hospitals in the area, particularly in Toronto and Hamilton. Both cities have an extensive medical research core. Public primary and secondary schooling is typically provided by school boards, largely organized at the municipal or county/regional level. The only school board that operates throughout the Golden Horseshoe is Conseil scolaire Viamonde, a public French-language school board, and Conseil scolaire catholique MonAvenir, a public French language separate school board. Peeks Caribbean Carnival is an annual cultural festival held in the City of Toronto. Toronto is an alpha global city, known for its performing arts and night life. Downtown Toronto is one of the largest central business districts in North America. The city is pedestrian friendly and has one of the lowest crime rates in Canada; the 45 murders committed in 2011 is the lowest for a major North American city. Formerly the tallest freestanding structure on land in the world, the CN Tower in Toronto is among the most internationally notable attractions in the Golden Horseshoe. Toronto's Yorkville is an example of a world-class shopping district in the city. The city also is home to several notable shopping malls such as Yorkdale Shopping Centre, Toronto Eaton Centre (which is North America's busiest shopping mall), Scarborough Town Centre, and Sherway Gardens. Located in the suburbs of Toronto are Vaughan Mills in Vaughan, Bramalea City Centre in Brampton and Square One Shopping Centre in Mississauga, the largest shopping mall in Ontario. Pacific Mall, in Markham, is the largest ethnic shopping mall in eastern Canada. 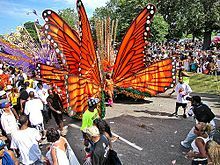 Large annual cultural festivals that draw tourists and local alike include Oktoberfest in Kitchener and the Peeks Caribbean Carnival (formerly known as Caribana) and Taste of the Danforth in Toronto. View of Webster's Falls in Hamilton. The falls is a part of the Niagara Escarpment Biosphere Reserve, which runs across the western portion of the Golden Horseshoe. The Niagara Escarpment, a world biosphere as designated by the United Nations, runs from the north at Bruce Peninsula and then east through the region cutting the Niagara Gorge at Niagara Falls. The Bruce Trail runs along the escarpment through mostly protected woodlands. The Cheltenham Badlands in Caledon is an environmentally degraded area along the Niagara Escarpment. Similar protection of some wooded areas exists on the Oak Ridges Moraine running east–west in the north end of the Greater Toronto Area, although development pressures continue to threaten the natural habitat. The Niagara Region has become one of the major wine-production areas in Canada. The Golden Horseshoe contains many small towns with tourist-jammed, historic main streets, most notably the community of Niagara-on-the-Lake, located at the mouth of the Niagara River. Niagara Falls is one of the world's largest waterfalls, and attracts millions to Clifton Hill, a neighbourhood featuring hundreds of amusements, souvenir stores, restaurants and skyline-changing hotels. Casinos here are also a huge draw. Hamilton has the historical reputation of being a blue-collar city; however, waterfront redevelopments and large-scale gentrification have been rapidly changing the perception of the city, although it retains a dominant industrial base. Barrie and Peterborough are situated close to scenic lakes, rivers and hills in the northern reaches of the Golden Horseshoe, where all-year around recreation contributes to the local economies, in addition to being major service centres. View of the Leviathan roller coaster at Canada's Wonderland. Located in Vaughan, Wonderland is Canada's largest amusement park. There are a number of theme parks in the Golden Horseshoe, all of which are seasonal. 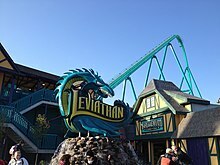 Canada's Wonderland, run by Cedar Fair in Vaughan, 2 km (1.2 mi) north of Vaughan Mills, is the largest and most attended theme park in Canada, as well as the most attended seasonal theme park in North America. Other theme parks include Wet'n'Wild Toronto (formerly Wild Water Kingdom) in Brampton, African Lion Safari in Hamilton and Cambridge, and Marineland in Niagara Falls. Though not a theme park per se, the Exhibition Place hosts the annual Canadian National Exhibition. The Golden Horseshoe hosted the 2015 Pan American Games and the 2015 Parapan American Games. The Queen Elizabeth Way is a major controlled-access highway that connects Greater Toronto with the Niagara Peninsula. 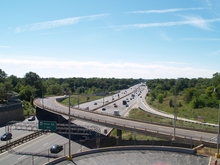 The Golden Horseshoe is served by an extensive network of expressways, the backbone of which is the Queen Elizabeth Way and Highway 401, one of the widest and busiest expressways in the world. Public transit in the region is coordinated by Metrolinx. Regional transit is provided by GO Transit trains and buses, and by private bus operators Greyhound and Coach Canada. Local transit is provided by municipal agencies, the largest of which is the Toronto Transit Commission, which operates three subway lines and one light metro line and an extensive bus and streetcar network. Toronto is currently the only city in the area with a rail-based local transit network, though its subway system extends to Vaughan as well at Vaughan Metropolitan Centre station since December 2017. However, several cities in the region have light rail lines in the works. These include the approved Hurontario LRT in Peel Region and B-Line in Hamilton. The primary airport of the region is Toronto Pearson International Airport (officially Lester B. Pearson International Airport), located in Mississauga, which is the busiest in Canada and the 31st busiest in the world, handling over 49.5 million passengers in 2018, and offering non-stop flights worldwide. Other regional airports of significance include John C. Munro Hamilton International Airport located in southern Hamilton, which is a major regional freight and courier location; Buttonville Airport and Billy Bishop airport in the Greater Toronto Area, both of which mostly serve regional business travellers but the latter being the third largest in the region for passenger volume. Within driving distance is Buffalo Niagara International Airport in Cheektowaga, New York, in the United States. Buffalo Niagara carries the second largest passenger volume in the region, serving over 5 million passengers in 2018. It is frequently used by Canadian passengers flying to U.S. destinations. Skyline of Downtown Toronto. The city is the financial anchor of the Golden Horseshoe. Hamilton lies at the western edge of Lake Ontario, and is the geographic centre of the Golden Horseshoe. Niagara Falls is a major tourist destination, situated at the southern portion of the Golden Horseshoe. Population figures are from the 2016 census. The census metropolitan areas listed below are within the Greater Golden Horseshoe. Not all land within the Greater Golden Horseshoe is part of a Census Metropolitan Area; some Census Metropolitan Areas are partly in the Golden Horseshoe and partly outside it. ^ Canada, Government of Canada, Statistics. "Table 1.1Population and demographic factors of growth by census metropolitan area, Canada". www.statcan.gc.ca. Retrieved 2018-01-30. ^ "Portrait of the Canadian Population in 2006: Subprovincial population dynamics, Greater Golden Horseshoe". Statistics Canada, 2006 Census of Population. 2007-03-13. Retrieved 2007-03-13. ^ Barber, Katherine, ed. (2005). "Golden Horseshoe". Canadian Oxford Dictionary (2nd ed.). Oxford University Press. ISBN 9780195418163. Retrieved 11 September 2017. ORIGIN: So called with reference to the area's wealth and horseshoe-like shape. ^ "Fast Facts from Hamilton's Past". Archived from the original on 2006-09-05. Retrieved 2007-01-08. ^ Strada, Eric. "Looking Back: The Golden Truth". Biz Magazine. Postmedia Network. Retrieved September 13, 2017. ^ "Places to Grow". Archived from the original on 2006-09-07. Retrieved 2006-09-13. ^ "Places to Grow Act, 2005 - Ontario Regulation 416/05 - Growth Plan Areas". Government of Ontario. Retrieved January 30, 2019. ^ Marr, Garry. "Ontario slaps 15% tax on foreign buyers, expands rent control in 16-point plan to cool housing". Financial Post. Retrieved 30 April 2017. ^ Office of the Premier (April 20, 2017). "News Release: Making Housing More Affordable". Queen's Printer for Ontario. Retrieved 30 April 2017. introducing a 15 per cent Non-Resident Speculation Tax (NRST) on non-Canadian citizens, non-permanent residents and non-Canadian corporations buying residential properties containing one to six units in the Greater Golden Horseshoe (GGH). ^ "For a Greater Region". Metrolinx. Retrieved June 30, 2018. ^ "Greater Golden Horseshoe, GTA and Hamilton Population, Household and Employment Forecasts" (PDF). Regional Municipality of York. February 2005. Archived from the original (PDF) on July 6, 2011. ^ "Toronto Stock Exchange is the Third Largest in North America". 2Ontario.com. Archived from the original on February 11, 2007. ^ "Innovation & Technology". www.brampton.ca. ^ "Canadian Shopping Centre Study" (PDF). Retail Council of Canada. December 2016. Retrieved 18 January 2017. ^ "About Us". Metrolinx. Retrieved June 30, 2018. ^ Outhit, Jeff (Oct 27, 2011). "Rail yard purchased for rapid transit". Waterloo Region Record. Retrieved 2012-04-08. ^ "Hurontario/Main Street Corridor Master Plan" (PDF). MMM Group. October 2010. p. 578. Archived from the original (PDF) on 2012-03-24. Retrieved 2012-04-08.